Music is a subject I love to burrow into, visually as well as aurally. Two recent cultural experiences enhanced my appreciation for the medium and its messages. 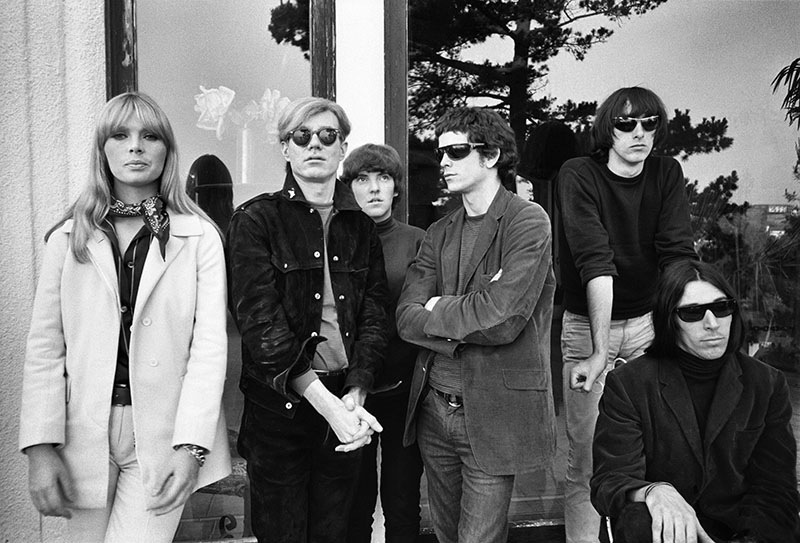 Andy Warhol, the Velvet Underground and Nico. Photo by Steve Schapiro. Steve Schapiro is a photographer whose masterful work over almost five decades has spanned punk rock and movie masterpieces. His exhibit of photos of Andy Warhol, Lou Reed and the Velvet Underground, and David Bowie closed last weekend at the Ed Paschke Art Center. The exhibit featured a couple of dozen iconic black and white photos of these music legends. The art center also showed a 30-minute video about Schapiro with many examples of his earlier work, shooting movie set photos during films such as Midnight Cowboy, The Godfather, Taxi Driver and Chinatown. There also are scenes from a recent conversation between Schapiro and Dustin Hoffman as the actor reminisced about photos Schapiro took during those movie set years. Schapiro, now 80, lives and works in Chicago. He began taking photos when he was 9 and discovered the magic of the darkroom at summer camp. He’s currently shooting photos for several books and other projects, which you can read about in this interview. 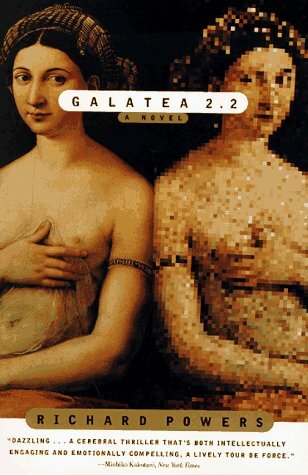 I’ve written about Richard Powers before, most notably in my review of the 2013 Spike Jonze film, Her, which I compared to Powers’ 1995 novel, Galatea 2.2. (It drew about 200 readers to my blog last year, more than any other post; it still continues to draw). Powers can be an acquired taste. I’ve read all his work and I acknowledge this fondness is something like my affinity for the late Portuguese writer, Jose Saramago. Powers is cerebral, mixes science and technology subjects with the arts, and his characters do not always come across as living, breathing humans. 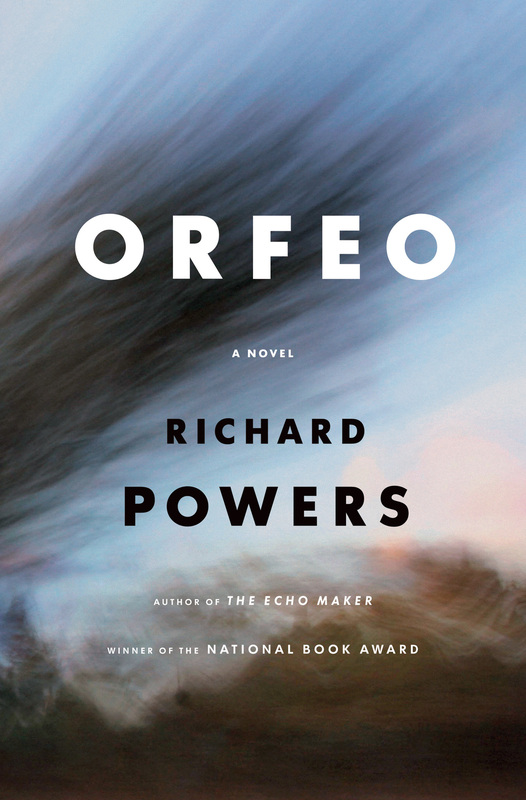 Orfeo is his latest novel and I think his best. You grow to care about his leading character and his quests in music and science. Powers displays breathtaking knowledge of ancient music, experimental music and composition. One long section of the book is about the composition of Quartet for the End of Time, composed in 1941 in a German prison camp by French composer Olivier Messiaen. Yesterday I had the luxury of a really immersive reading experience. About four hours of sitting around the Greensboro airport and the plane ride home. I realized that too often my reading is episodic—an hour in the afternoon when I finish work or a short session of reading in bed. I don’t know if it was the immersive reading or the nature of Powers’ book, but I found myself really caring about the people in Orfeo. The novel is about Els’ long history as an avant-garde composer and the lovers and friends he connects with in that passion. In retirement, he offers classes in music at a retirement center and is working with a bacterial human pathogen in his tricked-out home laboratory, where he’s trying to record his own compositions in bacterial DNA. This unfortunately attracts the attention of the Department of Homeland Security and people in hazmat suits arrive. Els flees and the story threads back and forth through his musical and romantic life to his current period of flight. Els is inspired by John Cage and participates in “Musicircus,” an exuberant 1968 extravaganza in Champaign, where Cage was in residence from 1967 to 1969. Powers’ Wikipedia page lists and describes his novels. I recommend dipping a toe into the Powers oeuvre. You might start with The Time of Our Singing (2003), which combines music and physics. And then move on to Orfeo and its musical magic. You can sign up to follow Nancy Bishop’s Journal and get an email whenever I post a new article, usually about once a week. Just type in your email address at the top of the righthand column and you’ll get an email asking you to verify your address. That’s it. No spam, no password. It’s the beginning of a new year and time to reflect on the pop culture year just ended. Critics did their top 10 lists of everything, but I’m going to do my list of 2014 favorites. Some of these are clearly eccentric choices–not necessarily “the best.” I’ve written about most of them during the year – either here or at Gapers Block or Culture Vulture. My favorite professional experience – my two weeks at the National Critics Institute at the Eugene O’Neill Theater Center. It was a fabulous and enriching two weeks, complete with inspiration from colleagues and visiting experts, lots of plays to review, and sleep deprivation. The institute strengthened my ability to write theater criticism and I did a lot of it this year. I wrote about 60 reviews—mostly theater but also reviews of art exhibits—for gapersblock.com and about 20 for culturevulture.net, a national arts website. — My review of Spike Jonze’s film Her, which I compared to Richard Powers’ novel Galatea 2.2. — An article demanding freedom for Oscar Lopez Rivera, a political prisoner in the US for 33 years. My favorite experiences as a theater critic and theatergoer aren’t necessarily the plays on other top 10 lists, but they are shows that I found thrilling. The Hypocrites’ All Our Tragic. This play was a masterful combination of all 32 extant Greek plays by Aeschylus, Euripides and Sophocles, written by Sean Graney. The 12 hours flew by, with plenty of breaks for food and conversation. Elevator Repair Service presented Gatz, a word-for-word reading of The Great Gatsby, at the MCA theater in 2006. Here’s a video sample of Gatz. Also among my 2014 favorites: Seven Homeless Mammoths Wander New England at Theater Wit; a fine production of Martin McDonagh’s The Lieutenant of Inishmore at Aston Rep; and Chicago Shakes’ King Lear highlighted by Larry Yando’s moving performance in the title role. My reviews of The Lieutenant and Lear. 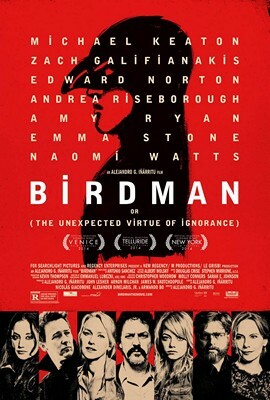 — Birdman, because it’s wildly inventive, sadly realistic, and beautiful to behold—especially if you love the backstage areas of old New York theaters. I’ve seen it twice and loved it both times. — Boyhood, because Richard Linklater, who is obviously fascinated with the concept of time (re his “Before” film trilogy), took the time to see a boy and his family grow and change over 12 years. — The Imitation Game. I could nitpick at plot points but the story is fascinating and Benedict Cumberbatch’s performance is award-worthy. — The Grand Budapest Hotel. Yes, I know this is kind of sweet and quirky or “twee” as Greg Mitchell tweeted. I just saw it for the second time and still enjoyed Wes Anderson’s visual fun and games. Favorite movie viewing experience: The Cabinet of Dr Caligari with a live organ performance at the Symphony Center on Halloween night. — National Gallery, a Frederick Wiseman documentary profile of London’s National Gallery, done in his fly-on-the-wall style with no narration or background music. — The Hairy Who and the Chicago Imagists, about which I wrote two different pieces—first when it was shown here briefly in June and then when the Gene Siskel Film Center showed it in the fall. — True Detective, the weird, creepy, gothic HBO series starring Woody Harrelson and Matthew McConnaughey. 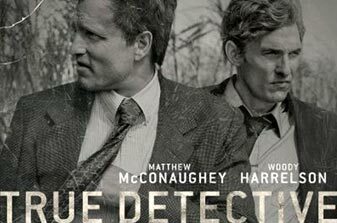 True Detective will come again this year with a different cast and story line, but I doubt it will compare to year 1. — The 2013 MusiCares Tribute to Bruce Springsteen, which was finally televised by PBS this fall. Many great performers cover his songs, finding new ways to interpret them, while Springsteen sat in the audience and watched. But he finally got to the stage to give his acceptance speech and play a few of his own songs. — Sonic Highways, Dave Grohl’s tribute to American music, illustrated with the music and musicians of eight cities on HBO. The Chicago segment was episode 1. You can still view it on demand, if you subscribe to HBO. 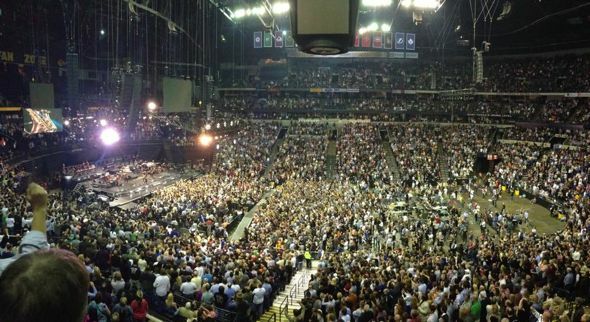 Bridgestone Arena, waiting for The Boss. Brad Paulsen photo. — Bruce Springsteen and the E Street Band in Nashville. No, he didn’t come to Chicago, so we took a road trip. — The Bruce Springsteen 65th birthday bash at Fitzgerald’s in Berwyn, organized by my friend, June Sawyers. In addition to the music, June and I read literary and not-so-literary commentary on Mr Springsteen. Biggest musical disappointment: The October concert at the Symphony Center by Chris Thile and Edgar Meyer. The music and the performances were quiet, indistinguishable and without passion. I knew they weren’t going to rock out, but I did expect some enthusiasm. Favorite album release: Leonard Cohen’s Popular Problems. The opening track, “Almost Like the Blues,” is especially fine. As the Pitchfork reviewer said, his music “sounds slick, but slightly off-kilter.” Springsteen’s High Hopes was also released in 2014, and of course I’ve listened to it many times. 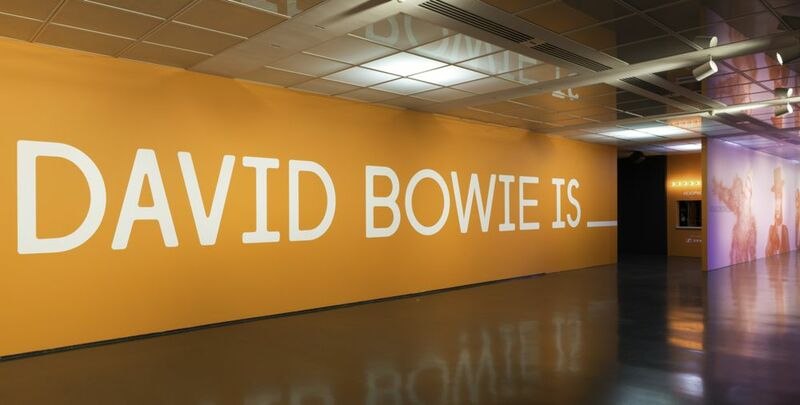 — David Bowie Is, which closes this weekend at the MCA. It’s an excellent exhibit and illuminates the genius of a musician who is ever conscious of his identity. My review. — Magritte: The Mystery of the Ordinary, 1926-1938, at the Art Institute. My comments. — The new Ed Paschke Art Center in Jefferson Park opened this summer and I was there. Mecca Flat Blues, an amazing exhibit of one of the many places where Chicago’s architecture and civic life collide, at the Chicago Cultural Center. This was my personal favorite article of the year. Chicago Magazine named it one of the must-reads of the week in April. I reprised it on my blog with added memories of Mies. — Hilary Mantel’s short stories, The Assassination of Margaret Thatcher. I had only read Mantel’s first book about Thomas Cromwell, Wolf Hall, which won the Man Booker Award. Her short stories are wildly different. 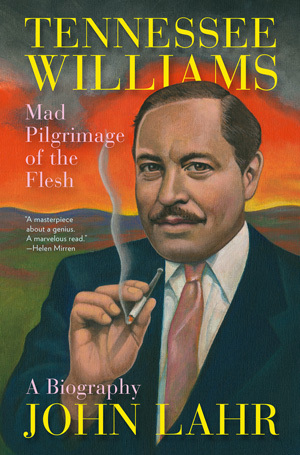 — John Lahr’s biography, Tennessee Williams: Mad Pilgrimage of the Flesh, is one of the best biographies I’ve ever read. I reviewed it and his appearance onstage at Steppenwolf. — Stoner, the 1965 novel by John Edward Williams that was recently rediscovered. Julian Barnes declared it the must-read novel of 2013. Stoner was a farm boy who went to college to study agriculture and discovered the world of literature. One reason I loved its quiet prose about a life of disappointments is that it’s mostly set on the campus of the University of Missouri; it was lovely to read Williams’ descriptions of the place where I spent two years. Think of it as grad school in a bottle. Two weeks of 20-hour days filled with discussions, theater productions, review writing and critiquing, and never, never enough sleep. 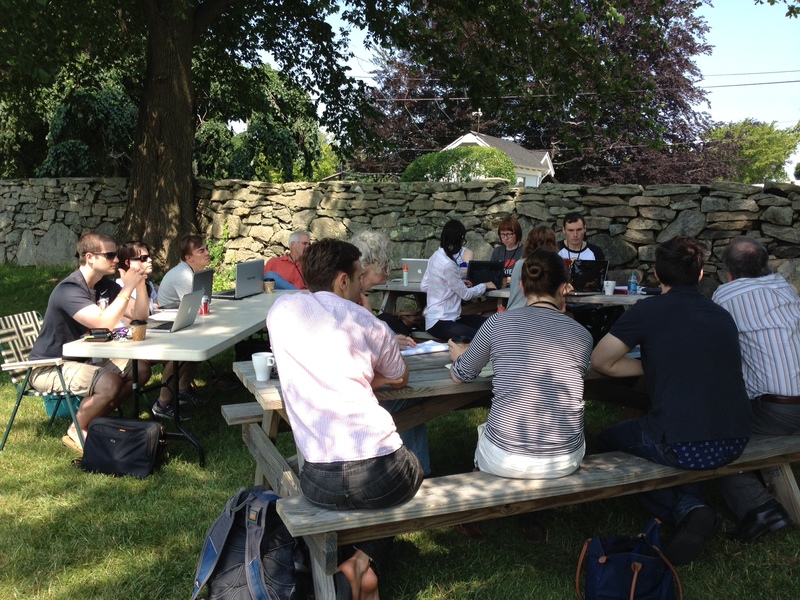 That was my recent two-week sojourn as a Fellow at the National Critics Institute at the Eugene O’Neill Theater Center in Waterford, Connecticut. The Monte Cristo Cottage, O’Neill’s childhood summer home, is in New London, a short drive from the campus. The house was the setting for his masterpiece, Long Day’s Journey into Night. We spent part of a day there, touring the house and talking about theater—and feeling some of the eerie O’Neill spirit. Many other theater conferences were going on at the O’Neill at the same time. The National Playwrights Conference, the National Music Theater Conference, and Theatermakers (a six-week intensive for student playwrights, actors and directors). The National Puppetry Conference had just ended and the Cabaret and Performance Conference was about to begin. My 13 fellow Fellows were theater and arts writers and a few graduate students, mostly from the northeast but also from Dallas, Phoenix and Louisville—and three of us from Chicago. Our days were filled with talks by visiting theater critics and other theater experts and sessions where our reviews were critiqued by Chris, the visitors and each other. It was a fabulously invigorating experience. Our nights were spent going to the theater and then writing reviews about what we had seen, for submission by early the next morning. Did I say never, never sleep? I’ll give you an overview of some of the sessions we had with visiting critics and theater folk. Michael Phillips, the Chicago Tribune’s chief film critic, is a former theater critic for the Tribune and several other papers. He talked about his favorite film and theater writers and gave us some valuable insights on writing reviews. He also talked about the art of adapting a work from stage to screen. Dan Sullivan, Jones’ predecessor as director of the NCI, was a theater critic for the LA Times and the Minneapolis Star-Tribune. We read the Tennessee Williams short story (“Portrait of a Girl in Glass”) that later became the play, The Glass Menagerie, and Dan talked about the structure of the play and its first reviews in 1944. Josh Horvath, a sound designer from Chicago, was at the O’Neill Center to handle sound design for one of the O’Neill productions. He described who handles what in the sound area during a production, and the difference between orchestration and sound. Jeffrey Sweet, playwright, who worked for years in Chicago, is author of Flyovers, The Value of Names, The Action Against Sol Schuman and Class Dismissed. He also is author of the new history celebrating the O’Neill’s 50th anniversary—The O’Neill: The Transformation of the Modern American Theater (Yale University Press, 2014). Matt Wolf, theater critic for the International New York Times and formerly for the International Herald-Tribune. He’s a Yank, based in London, so he regaled us with tales of the London theater scene. He also was an excellent person to work with on critiques of our reviews. Linda Winer, theater critic for Newsday, and formerly critic for the Chicago Tribune, provided a wealth of information about the role of the critic. William Grimes writes for the New York Times, where he was chief food critic from 1999 until 2004. He told us his personal rules for the colleagues who accompanied him on his food adventures (everyone orders something different, don’t eat slowly, make at least three visits to the restaurant) and gave us many great insights on writing—about food and other topics. Hedy Weiss, theater and dance critic for the Chicago Sun-Times. Hedy, a former dancer, had us start our session by doing stretches on the patio outside our meeting room. We watched different types of dance videos to get a sense of how to review this art that most of us were not experienced with. We also saw and reviewed the 2013 documentary—Afternoon of a Faun: Tanaquil Le Clercq—about the great ballerina who was stricken by polio at 27 and never danced again. After years of treatment and therapy, she was able to live a vibrant and active life (confined to a wheelchair) for several decades. The film was a PBS American Masters episode and had an art house release. Nick Wyman, president of Actors Equity and an actor in one of the National Music Theater productions. Peter Marks, theater critic for the Washington Post. Peter was a delightful and thoughtful participant in our discussions. I learned a lot from listening to him critique our reviews. O’Neill creatives—director, playwright, composer, lyricist and scene designer—who talked about their crafts and what pisses them off about theater reviews—and reviewers. We saw and reviewed four of the O’Neill productions in staged reading form. By agreement with O’Neill, I’m not at liberty to discuss those in any way. Playwrights live at the O’Neill for a month and work with directors and actors in rehearsals that result in public staged readings. A similar process enables several playwrights, lyricists, and composers to develop new work in a variety of music theater genres. 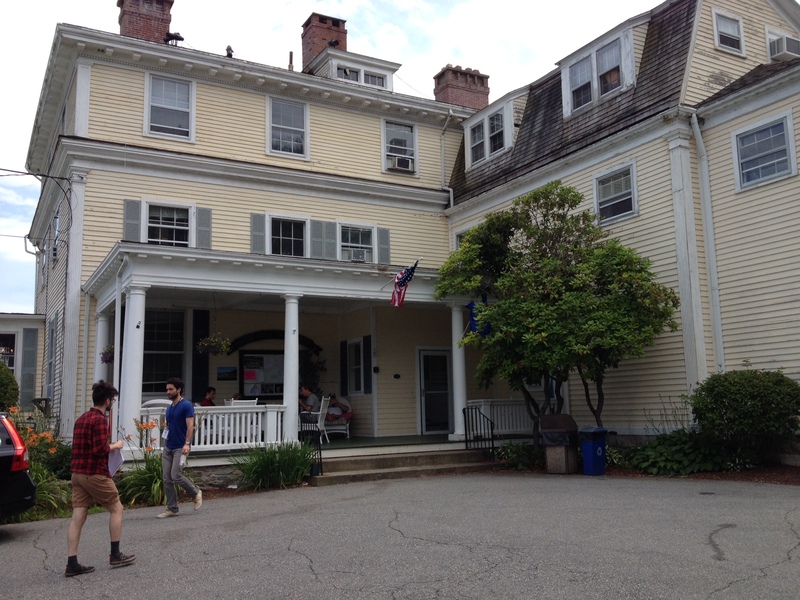 The O’Neill provides artistic and administrative support so that the artists can explore the material with directors, musicians, and Equity performers. Even after brief rehearsal and rewriting periods, you could see that some of these productions will definitely appear on stages or screens near you some time soon. 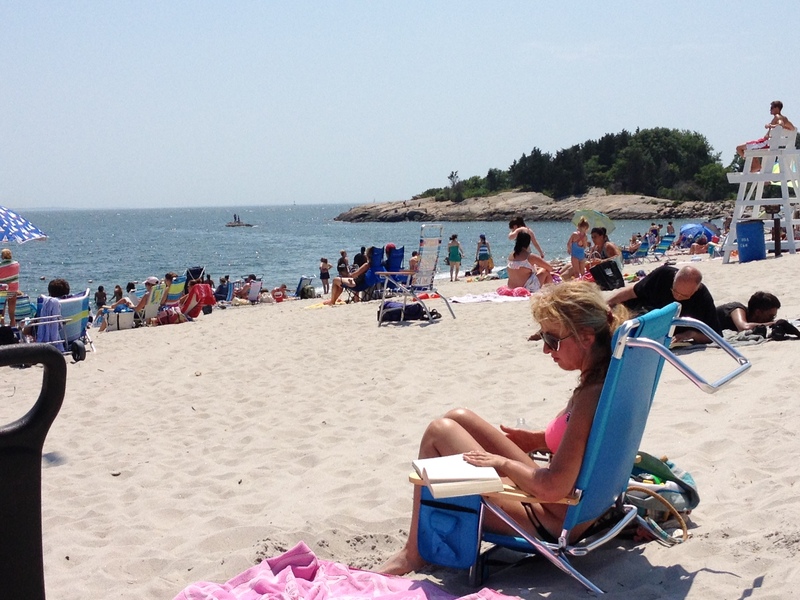 We also took field trips around Rhode Island and Connecticut to see and review regional theater. 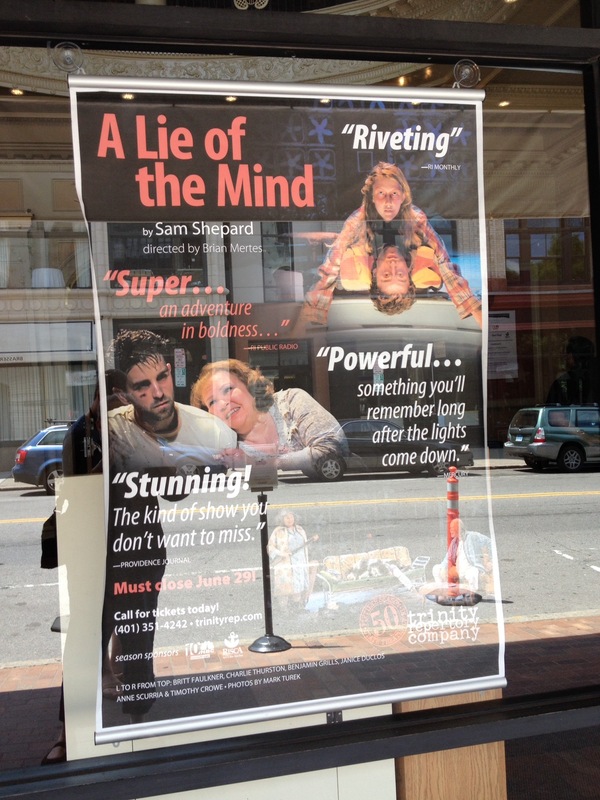 At Trinity Repertory Company in Providence, we saw an excellent production of Sam Shepard’s A Lie of the Mind. This veteran repertory company presented a gripping version of this Shepard play. It was my favorite performance of the two weeks. 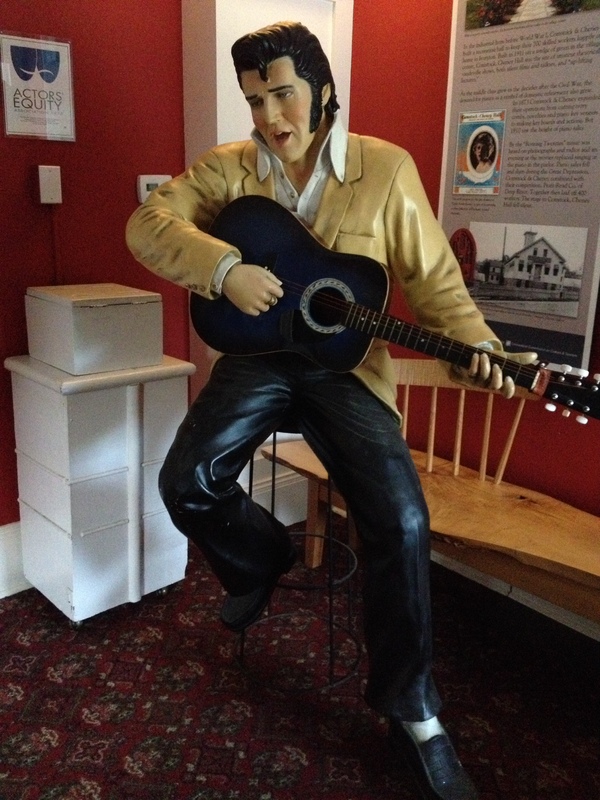 At the Ivoryton Playhouse in Ivoryton, Connecticut, we saw a so-so production of All Shook Up. The cast was enthusiastic but the quality was community-theater level. At the Goodspeed Opera House in East Haddam, Connecticut, we saw a fine production of Fiddler on the Roof. I should say, I heard a fine production. Some of us were sitting in the second-row balcony just over the stage where we had almost no view of the performance. The music was great. At Connecticut Repertory Theatre on the UConn campus in Storrs, we saw Leslie Uggams in a bizarre production of Gypsy. Bizarre because she was so miscast in the role. The theater trumpeted the production as the first time an African-American actor was cast in an Equity production of Gypsy with a multiracial cast. Many of the cast members were quite capable, but, unfortunately, Uggams was about 20 years past her time for this show. For the story to work, Mama Rose should be in her 40s or maybe early 50s but Uggams is in her 70s—and not a frisky 70. The actor who played her love interest was nearly comatose—either from shock or lack of direction. By the end of two weeks, we were all sleep-deprived but exhilarated from the intellectual and creative experience. We worked straight through from Saturday thru Friday 14 days later, with one day off. To make up for the relatively awful food in the campus cafeteria where we ate most of our meals, we had a few good food excursions. 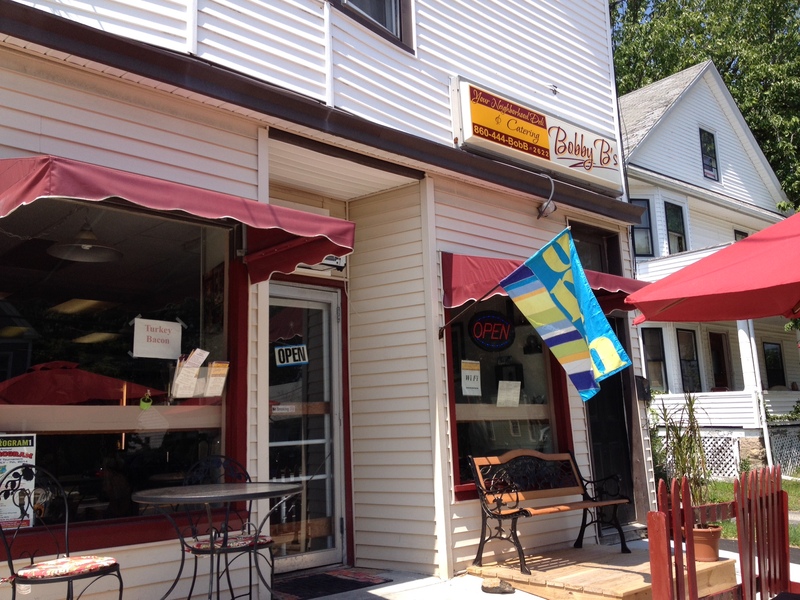 To Bobby B’s Deli, a short walk from our dorm, where we had amazing egg-on-bagel sandwiches. To a tavern in Ivoryton, where I had a sensational lobster roll. To Ocean Pizza in New London, for a fried scallop grinder that was mmm-mmm but too much to eat. To Azu in Mystic for some sophisticated casual food. To an Italian café in East Haddam for a pre-show dinner. And home again to eat my own cooking. Delicious. You can sign up to get an email each time I publish a new essay on Nancy Bishop’s Journal–usually about once a week. No spam, no password. Put your email address in at the upper right side of this page. And thanks for reading!